This technique can be used for any market that has a decent daily range. If you look at any chart, what do you see? You should see a succession of bars that are doing one of three things. Unless today's bar turns out to be an inside day or very rarely the high and low of today are exactly the same as the high and low as yesterday, then we will have a new high or low. Think about it. Today's bar, in all probability will make a higher high than yesterday's bar or a lower low than yesterday's bar. Now, the question is - how much of a higher high or lower low will today achieve than yesterday? In our next example, company XYZ had a range of 200 points (high minus the low) yesterday. Today the high might be 50 points higher than yesterday's high or 50 points lower than yesterday's low. If we can find the average daily distance between the high of yesterday's high to the high of today's bar and the average daily distance between the low of yesterday's bar and the low of today's bar, then we might have a trading opportunity. Make yourself a little excel sheet or grab a pen and paper and start tracking the high and lows of each day. Then deduct the high of today from yesterday's high and the low of today from yesterday's low. After you have a few day's worth of data you can get an average. On the excel sheet, below the first five columns are the date, open, high, low and close. "DR" is daily range, "TH-YH" is today's high minus yesterday's high and "YL-TL" is yesterday's low minus today's low. In the "TH-YH" column, I only record an entry if today's high is greater than yesterday's high and in the "YL-TL" I only record an entry if today's low is lower than yesterday's low. All pretty simple stuff. OK, as you can see, the example of the GBP/USD (Pound/Dollar). 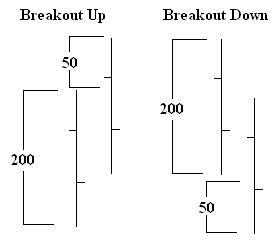 The average breakout up was 54 pips and the average breakout down was 60 pips. The next thing to do is apply this knowledge to our trading. On the 2nd September the high was 1.7972 and the low was 1.7864. We are looking for a breakout of either of these points. It doesn't matter which way. So on the 3rd September you mark the previous day's high and low and monitor what happens when it reaches these points. The way I trade this setup is to wait for the market to test the low or high of the previous day and then pullback. I don't enter on a break of the previous day's high/low, I wait for a pullback of either a test of the high/low or a break of the high/low. As you can see from the chart, the market came down and tested the low of 1.7864 and then pulled back. The low that was made was just a few pips lower than the previous day's low and formed a little support area. That support area is the breakout point. You can place an entry order a couple of pips below the support area with a target of the average "YL-TL" as a target, which in this case was 60 pips. The stop is a bit more tricky. If the pullback is not too big you can place your stop just above the pullback area (resistance). If the distance is too great, then just use a Dollar stop. You can even take this down to a 1 minute chart and scalp the market with a very tight stop. There are loads of ways to trade this setup. You could add some indicators for confirmation. You could use the entry as setup for a position trade. You could even concentrate on inside day's where the breakout might have a much larger range. However you decide to trade it, at least take note of the previous day's high and low.